Wheel explosions/multi-piece rim explosions and lock ring separations can have devastating consequences to those that work on or near these unreasonably dangerous products. Military, mining, intermodal rail and sea container port employees changing tires, inflating tires or working near lock ring type wheels are often seriously injured or suffer wrongful death. For more than 50 years manufacturers have known that the wheels can explode without warning and kill, yet they continue to be produced. The Occupational Health and Safety Administration "OSHA", attempted to ban the production of the wheels but failed at the hands of the wheel manufacturing lobby. In the tire and wheel industry they are commonly referred to as "widow makers" with good reason. Victims and their families often do not often know where to turn for compensation. Employers shirk the responsibility, manufacturers may be on the other side of the globe and most attorneys lack the knowledge, experience and financial resources to prosecute these types of cases. At Steinberg Burtker & Grossman we have long focused on the complex field of wheel and rim litigation. In a recent case involving the explosion of a multi-piece rim attorney Rick Grossman recovered over $8,300,000. on behalf of a severely injured tire serviceman. We have the training, knowledge, experience and resources to win these difficult cases. Nothing can make up for the loss of your loved ones or your serious injury. However, the wheel, tire manufacturers and your employer should be held accountable for their part in your suffering. Did the lock ring detach? Did metal fatigue or failure cause the rim base or flange to break off? Preserving the evidence from alteration or destruction can be the difference between winning and losing your case. The longer you wait to begin your case, the more likely it is that important evidence will be altered or destroyed. As your lawyers, we will put all of our years of experience and resources to work fighting for the compensation you deserve. 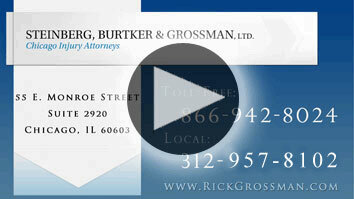 http://www.rickgrossman.com 866-942-8024 The attorneys at Steinberg, Burtker & Grossman practice exclusively in the area of personal injury litigation. For representation, contact the firm today in Chicago, Illinois. $8.3 Million to a tire serviceman who suffered brain damage and quadraparesis as a result of the explosion of a defective multi-piece rim. $4.0 Million to the estate of a man who died after knee replacement surgery at Evanston Hospital. $3.1 Million to the estate of a woman who died post child birth at the University of Chicago Hospital. $2.2 Million to the estate of a woman that was killed in a roll over vehicle accident on the Kennedy Expressway. $2.1 Million to the estate of a over medicated man who died at Rush University Medical Center. $2.0 Million to a tuck pointer who fell from scaffolding. $1.0 Million to the estate of an elderly woman who fell from her bed at the Rehabilitation Institute of Chicago. $1.0 Million to the estate of a woman killed by a City of Chicago fireman. $1.0 Million to the estate of a single woman killed in an airplane crash. $1.0 Million to the estate of a man who died in Loyola Hospital as a result of the mechanical failure of a respirator. $1.0 Million for the death of a baby from delayed treatment at Roseland Community Hospital. $800,000 to a man from undiagnosed carpel tunnel syndrome at Rush University Medical Center. $750,000 to motorcyclist who sustained severe injuries to his leg when struck by a motor vehicle. Serving Chicago, Wheaton, Naperville, Skokie, Des Plaines, Palatine, Northbrook, Lake Forest, Mundelein, Waukegan, North Chicago, Buffalo Grove, McHenry, Woodstock, Crystal Lake, Algonquin, Elgin, St Charles, Geneva, Aurora, Bolingbrook, Joliet, Cook County, Lake County, McHenry County, Will County, DuPage County, Kane County, Illinois.